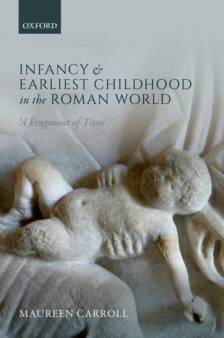 Maureen Carroll’s new book offers the first comprehensive study of infancy and earliest childhood in the Roman world. Maureen Carroll’s new book offers the first comprehensive study of infancy and earliest childhood in the Roman world, from conception and development in the womb to birth and milestone developments during the first year of life. It draws on a wide range of different types of evidence (archaeological, skeletal, textual, visual, legal) to provide fresh, interdisciplinary perspectives on this subject. It yields new insights through analysis of material culture in particular, placing the ancient texts traditionally used to understand perceptions of childhood in a broader context. It explores a wide chronological and geographic framing of the Roman evidence, covering roughly the fourth century BC to the third century AD and all regions throughout the Empire. Despite the developing emphasis in current scholarship on children in Roman culture, there has been relatively little research to date on the role and significance of the youngest children within the family and in society. This volume singles out this youngest age group, the under one-year-olds, in the first comprehensive study of infancy and earliest childhood to encompass the Roman Empire as a whole: integrating social and cultural history with archaeological evidence, funerary remains, material culture, and the iconography of infancy, it explores how the very particular historical circumstances into which Roman children were born affected their lives as well as prevailing attitudes towards them. Examination of these varied strands of evidence, drawn from throughout the Roman world from the fourth century BC to the third century AD, allows the rhetoric about earliest childhood in Roman texts to be more broadly contextualized and reveals the socio-cultural developments that took place in parent-child relationships over this period. Presenting a fresh perspective on archaeological and historical debates, the volume refutes the notion that high infant mortality conditioned Roman parents not to engage in the early life of their children or to view them, or their deaths, with indifference, and concludes that even within the first weeks and months of life Roman children were invested with social and gendered identities and were perceived as having both personhood and value within society. Maureen Carroll is Professor of Roman Archaeology at the University of Sheffield and is also a founding member of its Centre for the Archaeology of Childhood. She studied Classical Archaeology in Canada, the USA, and Germany, and was the recipient of the prestigious Balsdon Fellowship and the Hugh Last Fellowship at the British School at Rome in 2008 and 2016 respectively. She has published widely on infant death and burial in Roman Italy, on Roman funerary commemoration, and on Roman gardens, and has conducted excavations at major sites in the Roman world, including Pompeii and Vagnari in Italy and Cologne in Germany.